A mere three years after I got a ride in a prototype of the early Google self-driving cars, Elon Musk launched Tesla's autopilot. I'd experienced something like autopilot already, but to see it in a production car was thrilling. I walked into the local Tesla center and ordered a Model S that day. I took delivery in early December, and turned autopilot on as soon as I got on the highway leaving the factory in Fremont. The future had arrived! My feelings for Tesla over the following three years are... complicated. I admire what the company has been able to do. I've taken the factory tour a few times over the years, and it's staggering to witness the conversion of the old NUMMI factory into a modern marvel of engineering and automation. I loved knowing that my purchase of a Tesla was accelerating an industry's conversion from internal combustion engines to more environmentally friendly options. I was thrilled to know that my car was built just miles from my house. The nature of the way the car was constructed - heavy battery low to the ground, a single gear motor ensuring tons of torque from the minute you hit the accelerator - meant it was terribly fun to drive. As fun as it was, it was also the safest production car on the road. Win-win. Which brings me back to auto-pilot. I used it almost every day for the first two years I had the car. But as the company struggled to meet its Model 3 targets, I read several articles about the pressures being exerted on the company by leadership. Whistleblowers called attention to questionable safety decisions made repeatedly inside of the same factory I'd toured. There was the Apple engineer in his 30s who died when autopilot malfunctioned - on Highway 101, less than a mile from my office. The same team responsible for software that was buggy - I never knew if that podcast I was listening to when I turned the car off would be waiting for me when I turned it back on, or if the infotainment system would randomly select another for me - was the team responsible for the software that drove my car. Safety accidents caused concerns at the factory. I started to wonder whether I would keep the Model S when my lease was up. That's when I heard about the I-Pace. I'd never considered buying a Jaguar. But it was going to be an electric car, it looked decidedly different, and early reviews suggested it was going to be a competent alternative to a category Tesla had had all to itself for years. Build quality. This car is exceptionally well-built. The fit and finish are uniformly excellent. Where the Telsa's interior always felt a tad spartan, the I-Pace is clearly a luxury vehicle. Driver assistance. I remain surprised by what the Tesla chose not to include, given how technology-forward the car has always been. 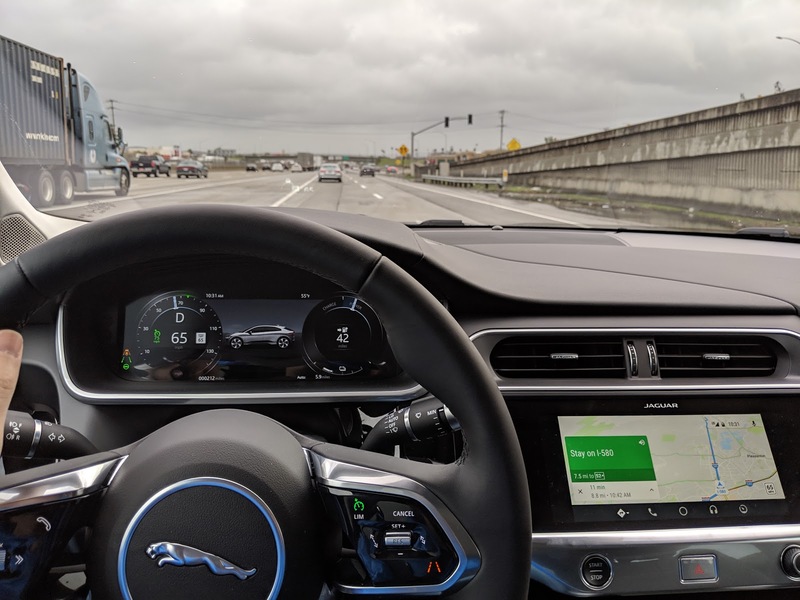 My I-Pace includes blind spot alerts in both rear view mirrors, along with audible alerts if you signal a turn into a lane where a vehicle is already present. Visibility in the car is generally good, but having additional alerts to help avoid an accident is a big win. 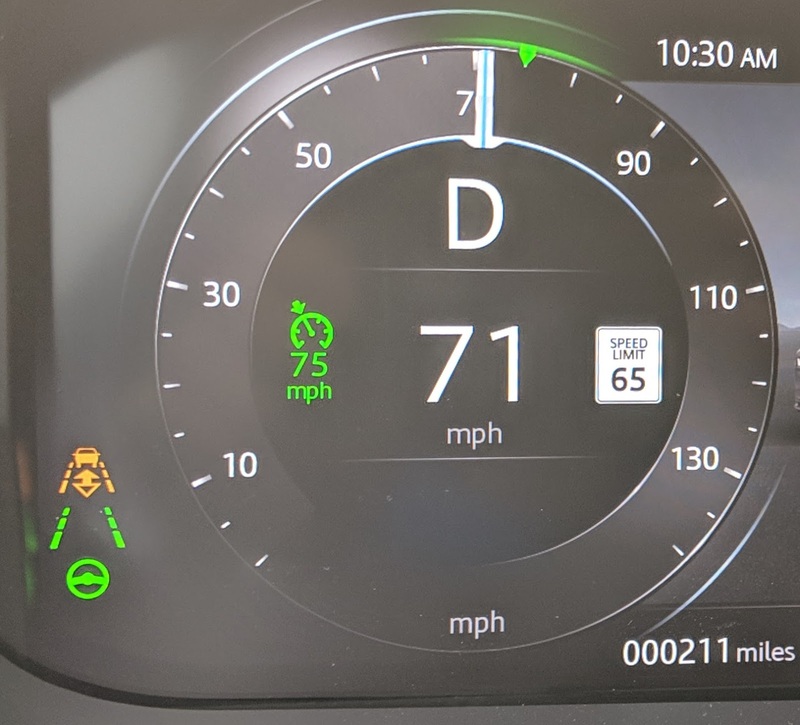 The heads-up display is OK, not great. (The HUD in my wife's Lincoln Navigator offers much more relevant info, for instance.) But it's nice to have the vehicle's speed displayed, call info, etc. without having to take your eyes off the road. Cruise Control. Though the I-Pace makes no claims to compete with Tesla's Autopilot, I was pleasantly surprised to find it offers both adaptive cruise control (set a speed, it will adjust as cars in front of you slow down, keeping speed with them) as well as steering assist (it will read the lane markings and control the steering to keep the vehicle in the middle of the lane). I've used it a few times, and don't yet know if I'll use it as regularly as I'd used Autopilot. Seems to work well, and it will yell at you if you take your hands off the wheel for more than a few seconds. Given my overall ambivalence to the current state of the art for cars (more or less) driving themselves, I think I'll generally be the one driving. 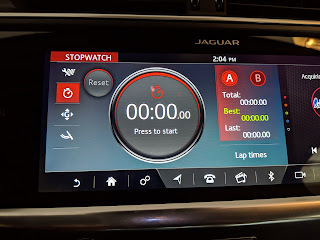 The green steering wheel means it's in steering assist mode; the green lines indicate that it's tracking the lane markers to stay inside the lane. The orange indicator indicates that it's staying a set distance from the vehicle in front of you. Also: it turns out, having buttons and knobs in the dash is quite a bit more useful than having a giant iPad control every feature in the vehicle. 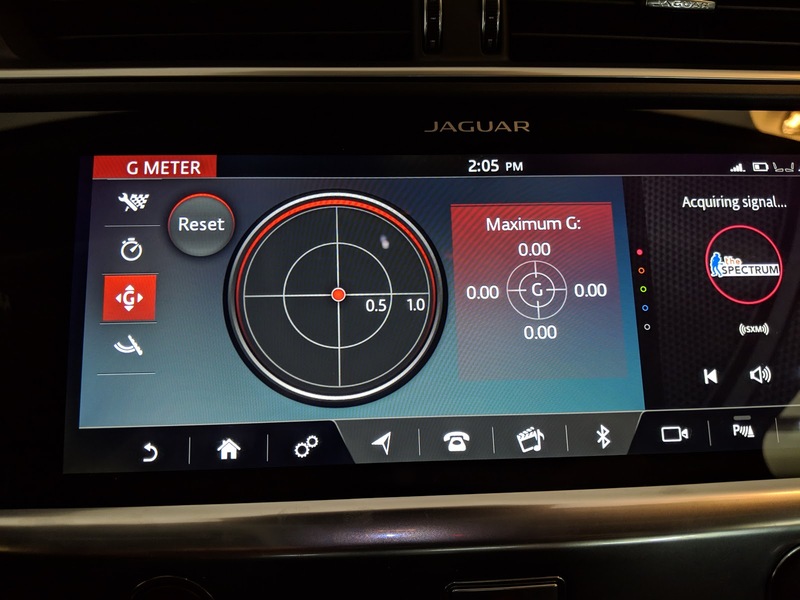 The Jag's layout is for the most part intuitive, and not having to swipe through lots of menus to get to a specific control is great. Driving. This is a driver's car. I'm sure part of my reaction is a general new/shiny honeymoon phase, but it is genuinely exciting to drive. By default, the car starts in "Comfort" mode, which smooths acceleration and defaults to a lighter steering / suspension mode. But you can put the car in "Dynamic" mode - resulting in faster acceleration, tighter steering, firmer suspension. You'll use more of the battery, but you'll have more fun. Several family members have reported that the ride as a passenger is more pleasant - I think this is due to a few factors: first, it's just more comfortable due to more headroom and legroom in the cabin. Second, the I-Pace has an air suspension that my Model S did not (it was an option, I didn't add it). Overall, my passengers prefer riding along in the I-Pace, for whatever that's worth. 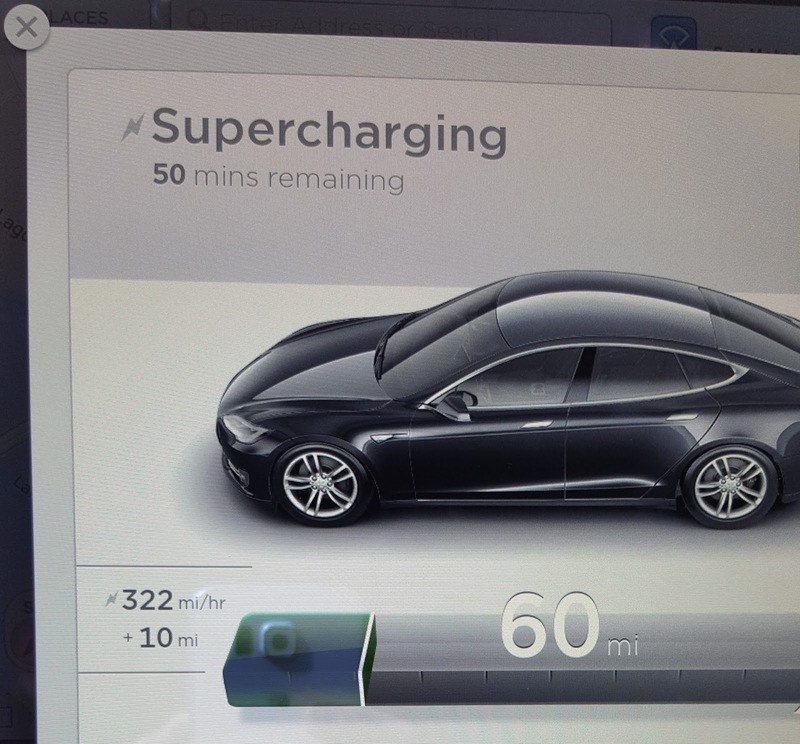 If you have range anxiety, you have a third mode: "Eco", which will optimize for extracting every last mile out of your charge. You'll lose some of the car's performance abilities, but you'll drive longer. The seats are the most comfortable seats I've ever had - the driver support is light years beyond what I'd had in my Model S. They are infinitely adjustable - leg support, lumbar support, lower back side support, etc. - once I found the setting that felt ideal, I never looked back. Range. There's been quite a bit of chatter online about whether the I-Pace's range holds up. They'd originally claimed a range >240 miles on a full charge; the EPA rates it at 234 miles, and owners are reporting a fair bit of variability, with some being disappointed by sub-200 mile rides. Here's what I can say: when I took delivery of my Model S in 2015, it said that my battery (at 90% charge; Tesla doesn't recommend charging to 100%) had 250+ miles of range. Over a few years, that degraded a tad to ~238 miles. In reality, my actual range was more like 160-180 miles. First, you never drive to empty. Second, different driving conditions - esp. local roads with lots of stops and starts - often diminished total range. That said, I could always charge at home, and the Supercharger network was never far from wherever I was. So I never really cared about range. 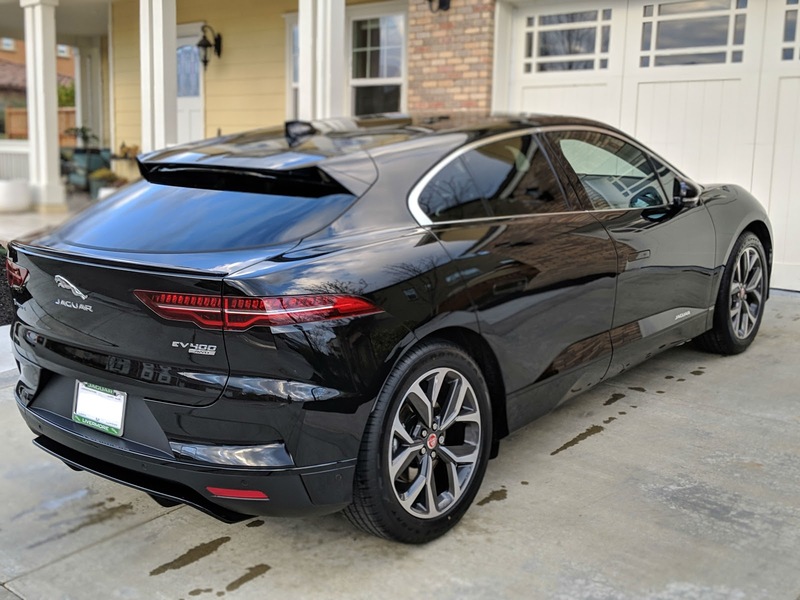 For the I-Pace, after just a few hundred miles of driving, I'm inclined to think it'll be something similar. When fully charged, it tells me my range is ~260 miles (it's adjusting for your driving behavior as well as the driving mode you're in), and apparently I'm an efficient driver so far. But I fully expect that number to decline as it gets more data and as the battery capacity degrades a tad. Frunk. Like w/my Model S, you can pop the hood. Unlike with the Model S, you can't actually store stuff in there. The storage space in the I-Pace's frunk is hilariously small. You could fit a few books in there, maybe even a small briefcase. But beyond that? The trunk or the cabin are your only choices. No worries, the Chargepoint map showed a DC fast charger nearby - great! Drove there yesterday, only to learn that there are two incompatible DC fast-charging implementations: CHAdeMO (doesn't work with the I-Pace) and CCS/SAE (works). (Side note: who came up with these acronyms?!) Remembering the dealer telling me I could swing by and use their charger whenever I wanted, I drove to the dealer (~10 miles away). Showed up, and learned that their charger had been offline since last night. Plan C: I'd seen a news report that Electrify America had just installed the two fastest chargers in the U.S. a few miles from my house. Off I went. In short: the reliability, ubiquity, and consistency of the supercharger network is a big, big advantage for Tesla. I'm hopeful that my Chargepoint Home malfunction was a fluke - if so, charging at home will be easy and dependable, and for the vast majority of my trips, I'll be fine. But for longer trips, I'd have to do quite a bit more planning than I'd ever had to do with the Tesla. This doesn't mean I regret my purchase - I definitely don't! But it's to Tesla's credit that they removed one of the big obstacles to electric car ownership and totally nailed the user experience from discovery to delivery to payment processing. Implementation matters, and the non-Tesla commercial charging experience right now is a patchwork of incompatible formats and let's-see-if-this-works payment processing. It'll work (eventually), but it takes patience. For non-Tesla electric cars to really go past the tipping point, we're going to need a similarly robust and reliable charging infrastructure - and if yesterday's experience is any indication, we're not there yet. Conclusion: I adore my I-Pace. It doesn't look quite like anything else on the road, it drives like a dream, and the interior is more comfortable, roomier, and laid out in an intuitive way. Other Tesla owners who've grown wary of time devoted to stupid easter eggs instead of fixing long-standing bugs (a whoopee cushion? seriously?! ) but who are bought into electric car ownership will find the I-Pace to be a worthy alternative. And those who haven't yet made the leap into an electric vehicle should be warned: one test drive of this car will make it hard for any other vehicle to match up. Miles driven since last charge: The Tesla trip odometer provided this info by default, and it's a nice way to have eyes on your actual range for a given charge. I haven't figured out if this is presented anywhere, but it'd be nice to be able to access it. GPS in the car seems to only work if the phone is actually in the closed center console. If the phone is out and accessible, the phone's GPS receiver struggles to triangulate on the GPS satellites; if it's in the center console, it's much more reliable. Other owners have reported similar behavior - guessing it's tied to the construction of the panoramic glass roof... whatever it is, it means my phone is out of reach and unlikely to hear me. Fortunately, if I trigger the Google Assistant from Android Auto's touchscreen, it uses the car's built-in microphones, and it works fine. The second screen is great for displaying media info (or controlling the phone) when the primary screen is showing Android Auto/CarPlay. Really wish it'd show the artist/song title instead of just the channel name. Another Android Auto wishlist item: really wish any of the electric charging apps (EVgo, Chargepoint, PlugShare, etc.) were categorized as Maps apps in Android Auto so I could easily select them to pull up a list of charging stations nearby and see what their charging capacities are. The Jaguar Android app isn't the most beautiful thing I've ever seen, but it mostly gets the job done. That said: naming the app "Remote" is... not the best decision. 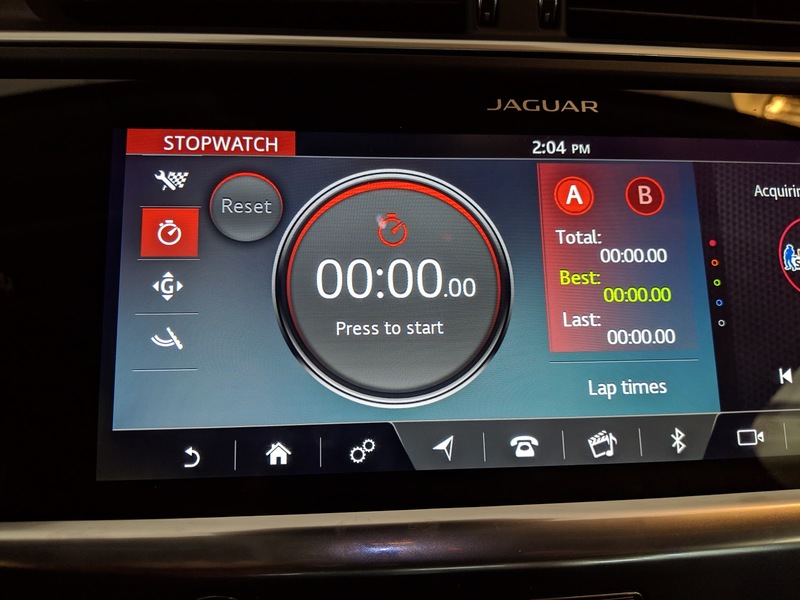 When your app drawer is alphabetized by default, you'd expect to find it listed under "J" for "Jaguar", or "I" for "I-Pace". Definitely not expected that it'd be under "R" for "Remote". When I took delivery of the car, OTA updates were disabled. I think this was an oversight on the part of the dealer - but I was surprised, when poking through the car settings menu, to see "Updates" set to "Off". 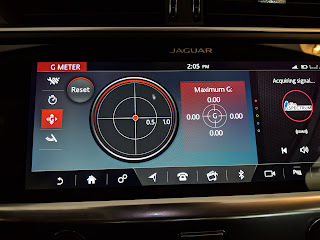 OTA updates are one of the many advantages to modern cars - I don't want to have to take the car to a dealer to get the latest software - this is the sort of thing that should be on by default. Earlier this year, I cleaned up my contacts and became interested in what the gender split would look like for my address book. Not only was it no better than my Twitter experiment from last year, the numbers were exactly the same. Of the just over 1,900 contacts in my primary address book, 399 are women. Last year, people I followed on Twitter were 79.7% men; today my address book is 79.9% men. If the majority of leaders at most companies are men and if the majority of their networks are men (as mine are), then this is a self-perpetuating problem. A month or so ago, I got to wondering whether there was any way to determine the gender of my LinkedIn network. Surprisingly, LinkedIn doesn't even ask for gender on sign-up, so I couldn't just pull the info directly from LinkedIn. And I didn't need a 100% accurate solution – I just wanted a directionally-useful metric. Step 5 creates several columns, as Google Sheets will bring in the Genderize.io query results into the spreadsheet; unfortunately, it does not properly split the gender result into its own columns. Create a new column and use the "Split" command to break the string [gender:"female"] into separate cells, then use "CountIF" to count how many times the word "female" appears in your worksheet. Divide that number by the total number of rows in your spreadsheet, and you have your % of female contacts. Then I remembered the photo albums. Dozens and dozens of photo albums. Actual dead-tree, hold-in-your-hand, photo albums. Photo albums from my childhood. Photo albums from my wife’s childhood. Photo albums from our early, pre-digital life together. Photo albums from grandparents, passed down to us when they died. Photo albums that none of us had looked at in years. So naturally I got rid of them. Read the full post over at Medium. Finally got a chance to try out writing on Medium, @ev's new platform for writing on the web. I loved the experience, and expect I'll use it some more in the months ahead to get out a few other posts I've been thinking about. I wrote about a tough decision we made in 2010 to shut down Blogger's oldest feature: FTP publishing. (Back in 2010 I wrote about the announcement here.) The gist of the post is captured in the quote below, but I encourage you to read the whole thing. It’s easy to say yes when a customer (or prospect) asks for a new feature: after all, if it’s just a day or two of engineering time, why not? But you quickly lose sight of the product you’re building: your product no longer has a coherent vision, and each new feature brings with it uncertain support costs that will last as long as the feature remains. Much harder — but much more important — is the discipline to question whether the feature is a required piece of what you’re building. New or old, easy or hard — if the feature does not support the overall product goals, it has to go. Customers and team-members alike respond to that discipline — particularly if it results in better support, more predictable development, and a clearer understanding of what it is you’re trying to build. On the day Google’s acquisition of FeedBurner closed in 2007, it was also the first day of a new quarter at Google. My new manager at Google asked me to draft my OKRs for him to review. I had no idea what he was talking about. I’ve now gone through the process of setting my Objectives and Key Results (OKRs) 24 times, and each time I marvel at what an effective mechanism they are for focusing my effort as well as aligning my work with the company’s objectives. Last fall, I led a workshop about OKRs at the Startup Lab, which we’re making public today. John Doerr originally presented OKRs to Google’s leadership in 1999 when Google was less than a year old, and they’ve been in use ever since. In the video, I present a portion of John’s original deck, then lay out how we’ve implemented them at Google over the years. I also shared a few of my OKRs from my time as a Product Manager on Blogger, and answered some questions from the employees at our portfolio companies who were present for the workshop. The “sweet spot” for an OKR grade is .6 – .7; if someone consistently gets 1.0, their OKRs aren’t ambitious enough. Low grades shouldn’t be punished; see them as data to help refine the next quarter’s OKRs. One comment: in talking recently with one portfolio company who’s implemented OKRs, I realized that I should have been more emphatic in pointing out that OKRs are not synonymous with employee evaluations. OKRs are about the company’s goals and how each employee contributes to those goals. Performance evaluations – which are entirely about evaluating how an employee performed in a given period – should be independent from their OKRs. We’ll cover employee evaluations in an upcoming workshop. Each year for the last four years, my wife and I have rented an RV and taken our kids to visit some of our national parks. 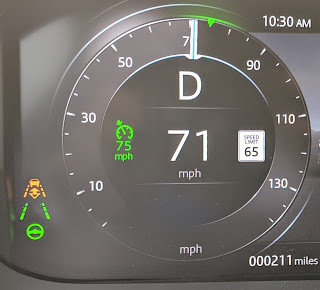 In that time, we've logged nearly 6,000 miles and we've visited the Grand Canyon, Zion and Bryce, Columbia River Gorge, Lassen Volcanic National Park, the Hoh Rainforest, and Olympic National Park. (Not to mention a number of wineries, parks, coastlines, and a bunch more.) This year, we're visiting Joshua Tree and Death Valley, and will swing back through Las Vegas on our way back to the Bay Area. It's safe to say that every year the spring break RV trip is one of the year's highlights. Whenever we do this, friends inevitably want to know more about the experience. After collecting questions on Google+, Facebook, and Twitter, I'm going to try to cover what it's like, what we wished we'd known, and we've learned since we started. Rental cost. This is almost always the first question. Our first year we rented from Cruise America; for the last two years we rented from El Monte RV, and this year we're renting from a local outfit that rents privately-owned RVs. For for the first two, prices ran about $100/day and included a set number of miles; you'll pay $.30-.40/additional mile. The local outfit is more expensive; I'll explain why we picked them over the others below. Gas. You should expect your RV to get somewhere around 8-10 mpg, so it should be relatively easy to figure out about how much you'll spend on gas by dividing your total trip distance by that number and multiplying by the cost of a gallon of gas. Lodging. We've paid as little as $20 for a night in an out-of-the-way RV park and as much as $65; I'd guess the average is somewhere around $40/night. How big is the RV? What's "Class C" mean? "Class A"? We've progressed: our first RV rental was a 25' Class C; the next two years we rented a 26' Class C with a slide-out, and this year we're renting a very small 30' Class A. (I say very small because a Class A could easily be 40' long (or longer).) Each of those links gives you a good feel for what the layout of the interior is; the difference between a Class A and Class C is whether the RV is built on top of a van chassis (Class C) or is a whole vehicle (Class A). Moving from the 25' to the 26' slide-out was a big step up; the increase in living space when you're parked for the night is a huge win. Believe it or not, the five of us (and our dog!) didn't feel cramped. (We did feel cramped in the 25' RV in that first year.) The boys often went to the bunk over the cab where they could read or play their videogames; my daughter often used the table to work on her activities or read. We'd seen a version of the RV we're renting this year (the Thor ACE) at an RV showroom near our home, and decided that we'd try to rent it if we could. 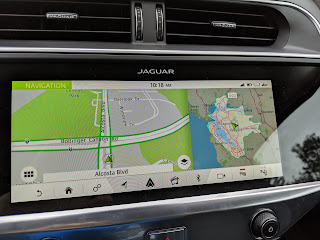 That led us to find SF Bay Area Private RVs; we liked the layout of the RV, the nicer appointments compared with what we'd rented from CA and El Monte, and the possibility of having a slightly quieter cab when we drive. I won't lie: the first hour driving an RV was a bit nerve-wracking. The RV takes up all but a few inches on either side of a highway lane. It's unnerving the first time you get out on the highway and realize how close to the cars and trucks you are. But it was really just about an hour; after that, you get used to driving with the mirrors and using turn signals well ahead of any turns. Turning on surface streets isn't particularly hard either: keep an eye on the side view mirror, and start turning once your back tire is even with the turn you're making. Once you learn those techniques, you're good to go. Length doesn't really matter: you're driving a big vehicle. The width is what's noticeably different; the rest is details. You do not need a different driver's license to operate an RV. How nice are the RV parks? Who stays there? The parks themselves vary in quality; if you're on vacation, you'll want to avoid parks that are mostly long-term residents. (Nothing against them, but the vibe is less "vacation" and more "keep it down, we live here".) Almost every park has laundry facilities, many have pools and exercise facilities, and it's pretty common to find game rooms (ping pong, pool tables, arcade games). While we generally don't spend a lot of daytime in the RV parks, they can be a nice place to hang out and let the kids knock around. We've met families like us traveling with their kids, we've met a number of foreign tourists visiting the US (renting an RV and seeing the national parks is apparently the thing to do if you're German), and a number of retirees. It didn't really occur to us when we started out how convenient the RV would be for eating while on the road. The fridges and freezers in the RVs can hold quite a bit, and operate continuously off of either your propane tank or electricity when you're parked. (See "a full hookup" below.) I think we knew we were hooked in our first year when we pulled up to an overlook on the Southern California coast, parked, fired up the stove and cooked Easter Sunday brunch while watching the waves crash on the beach below. Since then we've had countless meals in incredibly scenic spots. Sometimes we eat while driving, other times we stop and bask in the view. Having the food nearby is a huge benefit. Another perk that we hadn't realized when we started: we eat a lot less fastfood when we're on vacation. Aside from cost, friends seem most interested in how much you're "roughing it" in an RV. Putting aside the RVs that can run into the hundreds of thousands of dollars (be sure to check out Travel Channel's Extreme RV show if you're interested in those), we've found the experience to be surprisingly comfortable. The kids typically throw their scooters and a variety of toys into the storage bins, so when we show up at a new park, they can immediately grab a few of their things and get to exploring. Coupled with a fully stocked fridge and freezer, the reality is that we're always more supplied than when we were camping, and we generally have "our stuff" wherever we are. Compared to non-RV vacations where you've only got what's in a few suitcases, life in the RV always feels more comfortable and relaxed. Oh, and if you are traveling with kids, don't overlook the tremendous win that is an always-accessible bathroom no matter where you happen to be! Right... the sewage. How bad is it? We've spent nearly 30 nights in an RV so far over the last several years, and haven't ever once noticed an odor from the bathroom being on board. Non-issue. But... will I be connected? First things first: wifi at RV parks is often better than it is at hotels. That said, it's sometimes exactly what it is at hotels. I generally love being off the grid when we go on these trips. I turn on my out-of-office responder, turn my phone's sync feature off, and generally don't look at my work e-mail while I'm gone. That said, we frequently post pictures from the trip as we go, and often check in with family to let them know where we're at. As I mentioned above, we often watch a movie on Netflix or Amazon on one of our laptops after the kids go to bed. When we're driving, we have the option of running the RV's generator. 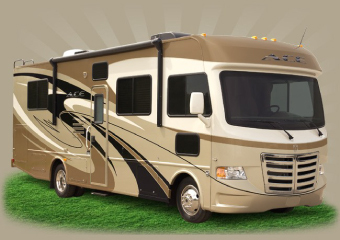 That makes electricity accessible while you're moving, which means they can watch the RV's TV, their gadgets can be plugged in, etc. We generally don't drive with the generator on – fortunately for us the kids like to watch the world go by (that is, after all, one of the real benefits of traveling in an RV). But there's almost always some point in the trip when everyone needs the downtime, and it's a nice backup. Our first RV didn't have a TV at all; each of the last several have had a TV and a DVD player. For as much TV as the kids watch, we don't actually watch much TV while on these trips. There was one point last year that it was raining at night, so we watched the Muppet Movie as a family. Made for a great night. Our experience with Cruise America was that the vehicles were in decent shape but a bit on the basic side. We are fortunate that El Monte's Bay Area location is just a few miles from our house, so it was easy to visit their building and see the various models first-hand. While we generally liked the vehicles we rented from El Monte, each of the last two years produced unwelcome maintenance issues. In addition to El Monte being local, we have a large RV showroom that's in the same town. In one of our visits there on a Saturday afternoon, we saw the Thor ACE – ACE stands for A/C Evolution, or a hybrid between a Class C and a Class A. The floorplan is a lot like a Class C (in particular the over-cab bunk where the kids sleep) but it has the overall design and approach of a Class A. We loved it. What we found once we took the plunge was that this was a wonderful way to get family time. It's definitely different and not without its own challenges, but the relaxed approach to travel, the convenience of better food, predictable accommodations, and space all make for a great experience. Though we have been fortunate to see some truly amazing destinations (and I expect both national parks this year to be equal to past trips), some of our fondest memories of these trips are from the journeys themselves. America still has some great road-side diners, and every once in a while there's a breathtaking vista that just materializes in front of you. Nothing beats pulling over and breaking out a meal to celebrate getting away from it all. What did I miss? Anything else you want to know about the experience? I'll add to this if needed; thanks to everyone who asked for this!